The Year of the Bike will feature new proposed bike infrastructure plans, community outreach, and a wide variety of cycling related events. One of the city’s inspirations to make 2013 the Year of the Bike was due to the fact that there were already numerous bicycle related events scheduled, said Art Raymond, the Director of Communications at Mayor Ralph Becker’s office. One such event is Salt Lake City’s Bike Share program, which is scheduled to debut on April 8th at 10:30 A.M. The program will launch with 13 Bike Share kiosks throughout the city and will feature bikes that are user-friendly and convenient, Raymond said. Another event called Open Streets is scheduled to take place on May 4th. An Open Streets event temporarily allows city streets to be used exclusively for bicycling, jogging, walking, and other non-automobile means of transportation. “These events encourage new people to try walking and bicycling in a comfortable and fun environment,” the city’s Department of Transportation website said. Salt Lake City’s Open Streets will take place on 300 South/Broadway, between 600 West and 200 East and feature a LiveGreen Festival and the Tour de Brewtah event – a cycling tour of the city’s breweries. Other Year of the Bike efforts include Salt Lake County’s creation of the County Connectivity Project, which will more efficiently connect bicycle lanes between counties and to major destinations. Bike Utah is hosting a Bicycling Summit at the University of Utah later this year and the city is working with Salt Lake’s cycling community on a new Bicycling and Pedestrian Master Plan, which is scheduled for completion later this year. UTA will install more efficient bicycle racks on every new bus that is purchased, according to UTA General Manager Mike Allegra. The new bicycle racks will hold three bicycles in order to accommodate growing cyclist ridership, as opposed to the racks that are in place now, which only hold two. UTA will also be installing bicycle hooks on existing and new TRAX trains this spring, which will help facilitate the growing number of cyclists who use public transportation on a daily basis, Allegra said. The Utah Department of Transportation will incorporate bicycle detection technology into traffic signals on Salt Lake City’s streets, said Deputy Director Carlos Braceras said. UDOT will also make useful bike infrastructure improvements during road preservation projects, Braceras said. This new commitment marks a sea change in UDOT toward the inclusion of convenient bike infrastructure in its road plans to date – a measure that could greatly enhance the quality of bicycling and commuting throughout Utah over the next several years. The city’s bicycling website – bikeslc.com – highlights all of the Year of the Bike plans – including bicycle infrastructure updates, cycling related events, and how to get involved in the city’s growing bicycle culture. Perhaps the main goal for the Year of the Bike is to promote education and awareness about cycling safety. Local retailers and non-profits are also doing their part to promote bike culture and the city’s Year of the Bike efforts. The Bicycle Collective offers free bicycling valet services for cyclists who ride to many of the Year of the Bike events, such as the Downtown Farmer’s Market and the Twilight Concert Series. FRESH – a clothing boutique in the 9th and 9th neighborhood – has been a bike-friendly retailer since it opened in 2009 and continues to incorporate cycling into their business. Ian Wade, the boutique’s owner, said FRESH offers a ten percent discount to customers who travel to the store on their bikes. According to BicycleBenefits.org, FRESH is one of 85 bicycle-friendly businesses in Salt Lake City that offer incentives for cyclists. Raymond said local retailers and private sector partnerships will continue to enhance bike culture in Salt Lake City. “We want to bring more people into the mix and get more people involved – and ultimately get more people on bikes,” he said. 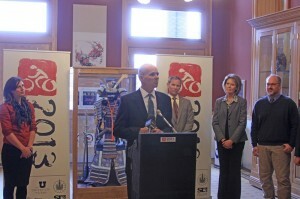 For more information about Year of the Bike, visit www.bikeslc.com.